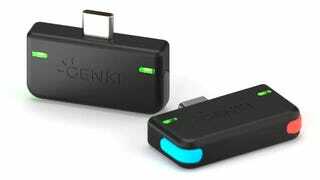 The Genki plugs directly into the Switch’s USB-C port, where it should have direct access to a digital stream of your game’s audio. As a result, there should be less lag than when using a Bluetooth adaptor plugged into the Switch’s headphone jack, which requires digital-to-analogue and then analogue-to-digital conversions as extra intermediate steps. The Genki also draws all the power it needs while connected, so you’d never need to charge it separately. The makers of the Genki claim it actually allows two sets of wireless headphones to be connected at the same time, so you can head-to-head game with your seat mate on your next flight without disturbing other passengers. 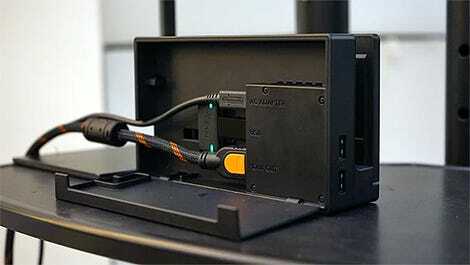 And because the USB-C port is used when the Switch is docked, the company also claims the Genki works with a USB adaptor so it can be plugged in to the old-school USB port on the back of the Switch’s dock.